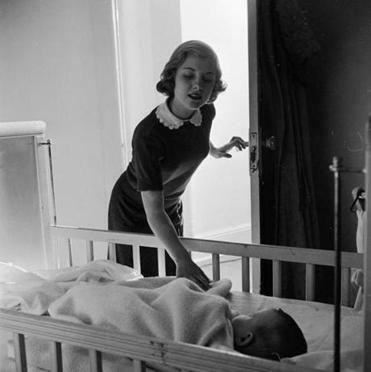 Circa 1948: A baby-sitter keeps a watchful eye on a sleeping child. Monstrous crimes are often, by definition, inexplicable. In our quest for meaning, though, narratives of such events are not always just pornoviolence, as Tom Wolfe once labeled Truman Capote’s “In Cold Blood,” noting that the point of that tale was the unveiling of the gory details themselves. Stories, the best of them, produce morality by provoking our response. Leila Slimani performs an admirable reversal then in her English language debut, “The Perfect Nanny,” winner of the 2017 Prix Goncourt. Unlike Capote, Slimani’s story of a seemingly ideal caretaker opens with its bloody conclusion: the stabbing murder of two children by their nanny, every working mother’s worst nightmare. It is a fiction inspired by the real-life killing of two New York children by their Dominican nanny. As Slimani’s book opens, the family’s apartment has been turned into a crime scene; one child is being zipped into a gray bag, the other about to die on the way to the hospital of head wounds. The nanny has admitted guilt by stabbing herself in the neck. So we begin “The Perfect Nanny” in horror, and then miraculously, swiftly, Slimani creates a person out of that powerful spectacle. In this fashion the novel functions like an extended Maupassant story turned inside out. Theirs is one of the smaller apartments in the building, and this financial pressure lures Myriam back to work, just as it leads Louise, the nanny, to come work for her. Louise has lost a child to her life’s disarray; Myriam hires a nanny to escape hers. Slimani is an astute observer of power politics in the home, how it can produce volatile allegiances. Paul, Myriam’s husband, fights her until all he can do is slip doubts under her mind’s rug. “If you think it’ll make you happy,” he says, noting a nanny will essentially cost her entire salary. As soon as Louise arrives, she takes charge of the house, and Paul looks on Myriam and Louise as a kind of tribe. Some novelists write with images. Slimani builds her story in moments like this, tiny ruptures captured in paragraph-long scenes that come together like a portrait etched in shards of glass. On Louise’s first day of work, she arrives early not having slept much. She lingers in the stairwell, not wanting to appear too eager, already making herself invisible. So much is there in the pink bicycle helmet. Paul is an entitled and slightly childish man so absorbed in appearing cool as he cycles to work that he views the woman he has employed to watch his children as almost an afterthought. A scant few pages after this book’s horrific opening, Slimani has produced a spark of empathy for Louise. In the ensuing chapters she does it again and again. She likewise connects us to the family. Paul feels he has wasted his youth; the children are at once feral and loving; Myriam hates herself for outsourcing love but refuses to give up her freedom. Narrating from a dazzling array of viewpoints, Slimani produces an ever-turning love triangle of possession and resentment. Paul and Louise share a carefree moment, excluding Myriam. Later, the two of them leave Louise at their door as they go to make love. The children shower affection on Louise, often, Myriam suspects, as revenge. Alone with the nanny, though, they can be vengeful. One of them bites on her on the shoulder. As the book circles ineluctably to its starting point, such incidents compound. Paul and Myriam hide their purchases from Louise as well as their habit of throwing out food. In return, Myriam, whose poverty is powerfully evoked, returns a chicken carcass from the trash and puts it on the table. Eventually, as we go back into Louise’s head it becomes clear something has gone awry. Here the novel begins to erase the sympathy it so vividly won back. The result is a book that provokes horror only to slide it aside and challenge us to forget it. Typically the addition of empathy — rather than its subtraction — feels more like life. John Freeman is the editor of Freeman’s and author of “Maps,’’ a collection of poems.